Only the best and brightest things go bump in the night…including enchanting bats. We are so excited to introduce our new Elysian Fields damask bedding print, featuring a whimsical dance of bats, venus flytraps, and other bump-in-the-night delights. In collaboration with the breathtaking Brooklyn business, Flavor Paper and the astoundingly talented artist Dan Funderburgh, this gorgeous new print is quickly becoming one of our favorites. We’ve long been fans of the work Flavor Paper does. With their innovative approach to hand screened printing and eco friendly options, this team of visionaries make us so proud to offer the new Elysian Fields damask bedding print. What we especially love about this print is how the details continue to unfold the more time you spend looking at it. What first appears to be a simple garden scene soon reveals some slightly more sinister details. Can you spot the little bone floating in the dark abyss? Perhaps it’s a treat for a hungry bat? Elysians Fields is a particularly unique print in that it evokes a beautifully historic feeling of nostalgic botanical designs. 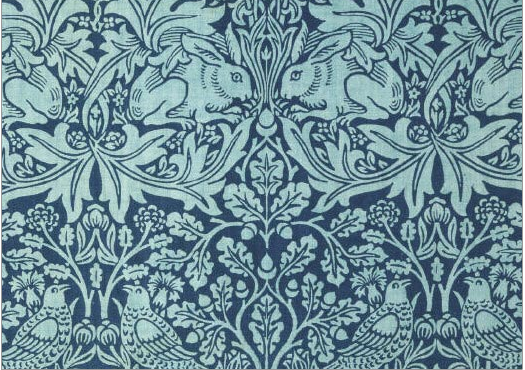 It harkens back to the divine artwork of famed English textile artist, William Morris. Much like the inspired pieces we see coming out of Flavor Paper, Morris was well known for his wallpaper designs. He captured gorgeously fresh patterns that were not only intricately complex in their layout, but wholly pleasing to the eye. He might hide a rabbit here or ensnare some strawberries over there, but no matter what the end result was always a piece of art. With a talent for color and interweaving botanical details, Morris transformed the way the middle class were able to decorate their homes. Elysian Fields captures this aesthetic and more. It gleefully embraces the historical vibe of botanical design while being infused with a slightly creepy gothic vibe we simply can’t get enough of. We love being able to offer this delicious new print in bedding, pajamas, shower curtains and And keep your eyes peeled in the upcoming months, since we’ve got new colors flapping their way into our warehouse in spring! We seriously can’t wait.